Click on the Article link to connect to the full text. 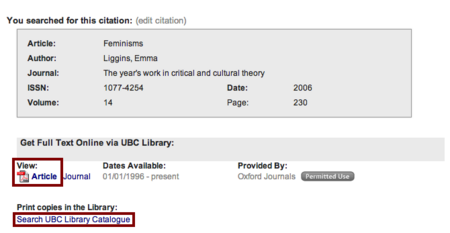 Where no full text is available, click on Search UBC Library Catalogue to find items in available in print at UBC Library. 3. Try searching for the title of the article in Summon. Enclose the title in "quotation marks" for a more efficient search. 4. If you still can't find the full text of the article, ask for assistance, or use our Interlibrary Loan Service to get the item from another library.